Everybody was in the mood for cooking this week! 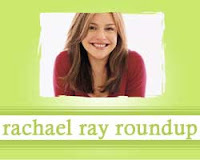 I found tons of great posts with people trying out Rachael Ray's recipes. I really do love those posts, since they are why I started this blog, and the Roundup, in the first place. Kristie at I Heart Kupcake tried Rachael's Thai Shrimp Curry with Chopped Lettuce and Basil-Lime Couscous. Kristen of Dine and Dish learned that even a great looking recipe for Sky Blue Potatoes didn't make her like blue cheese. Mary Ann of Meet Me in the Kitchen was impressed by Rachael's recipe for Fish Tacos with Quick Slaw, Avocado Sauce, and Green Rice. Food Lovers Like Me features an adapted version of Shrimp and Spaghetti in Coconut Broth. Caitlyn at Knitter in the Kitchen tested out Rachael's recipe for Move it Along Pork and Veggie Stir-Fry. Hope at Gets Bored Easily took advantage of Rachael's food crew feature (which is all about introducing new foods) and tried Ritzy White Pizza with arugula. Liz of Liz's Cooking Blog tested Rachael's recipe for Spinach and Feta Potatoes. According to the Real Deal, Rachael finally bought that Southampton home. Nan of Pots and Pins made a recipe that I was thinking about trying - Chicken Salsa Soup from the latest issue of Every Day with Rachael Ray. I think it's gotten too hot for soup now in my neck of the woods!